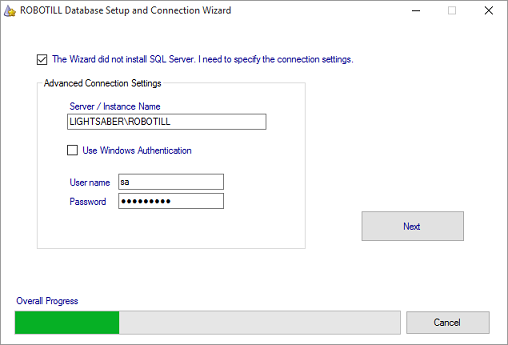 Please Note: The ROBOTILL Wizard can install SQL Server for you. 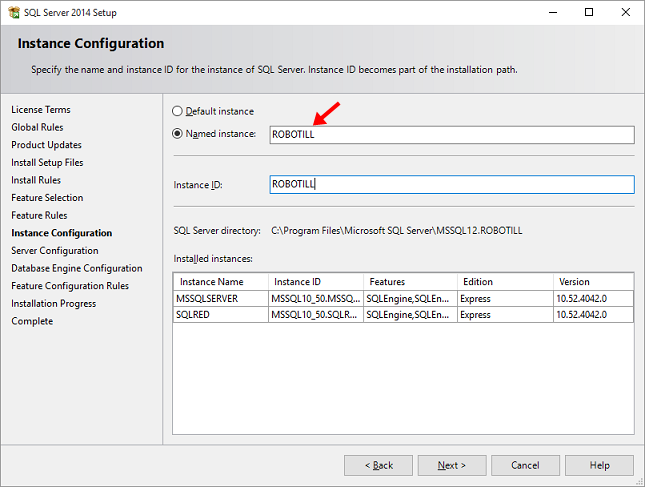 These instructions are only needed if you decide to install SQL Server yourself. Remember, you can also ask ROBOTILL Support to help you. Run the Setup file. You can accept the default extraction folder where the install files will be extracted. On the next screen accept the license terms (check the box) and click on Next. On the next screen (Feature Selection) you can just click on Next as the correct features should already be selected. 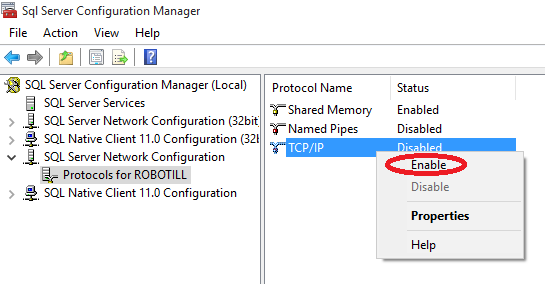 Change the Instance Name to 'ROBOTILL' and click on Next. On the Server Configuration Screen you can just accept the defaults and click on Next. 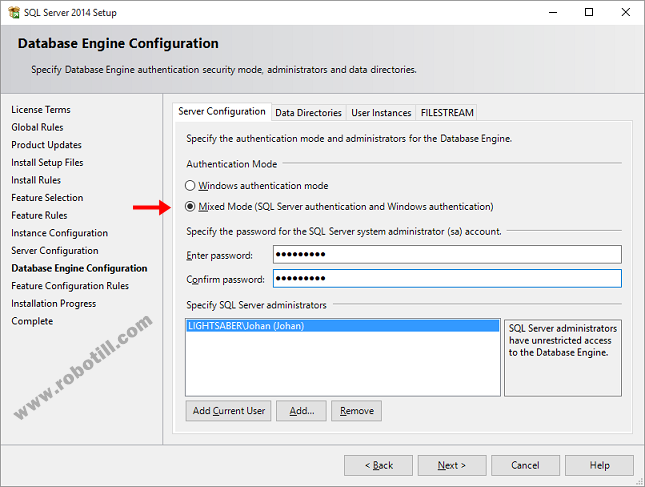 On the Database Engine Configuration screen change the Authentication Mode to Mixed Mode. Type in a password that is at least 8 characters long and contain uppercase and lowercase and at least one number. Make sure to write down the password. You will need it later and with each new install(computer) that you add to the system. Click on Next to complete the install. You need top open port 1433 for SQL Server in Windows Firewall to allow other computers to connect remotely. 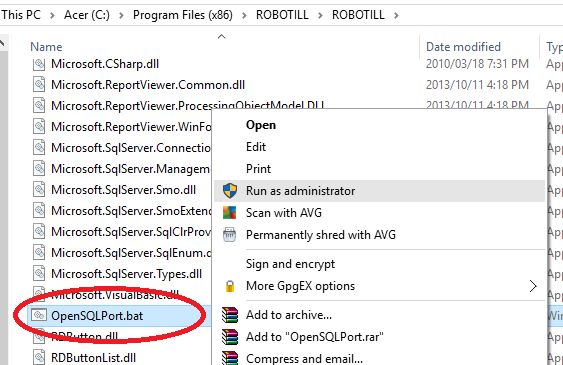 If you don't know how to do this you can just run the OpenSQLPort file in the ROBOTILL program folder. You need to run it as administrator. You also need to enable TCP/IP on the Server. Open 'Sql Server Configuration Manager'. Expand 'SQL Server Network Configuration' and select 'Protocols for ROBOTILL'. Right Click on TCP/IP and click on Enable. Select 'SQL Server Services' and then select 'SQL Server (ROBOTILL)'. Click on the Restart button - or you could just restart the computer. Start the ROBOTILL Database Setup Wizard. Select 'Server Installation'. On the next screen select 'I have installed SQL Server myself' and click on Next. Leave the user name as 'sa' and change the Password to the password you used when installing SQL Server. Click on Next. The Wizard will create the database.